Connexions are asking people to write to their MP asking them to sign it – or in the cases of Roger Godsiff, Richard Burden and Steve McCabe, thanking them for signing it already. Here is a model letter for you to adapt – if you have personal experience of using Connexions and can tell your MP how they helped you, then please do – the more individual stories they get the better. Please can you support this Early Day Motion which is being raised by Labour MPs, which questions the decimation of the Connexions Services nationally before the Con-Dems’ National Career Service comes on board next April (and for which the funding is not yet clear). In Birmingham where I live, Connexions are facing a 30% cut this year which we have resisted by sustaining a UNISON led campaign to preserve our service to young people. Birmingham has an above average level of youth unemployment and the destruction of this service will only act to further marginalise young people in this city who are unable to get advice on employment and training. The following EDM has been tabled in parliament by Alan Meale MP on Careers and Connexions Services. It currently has 27 cross party signatures. Lots of events have been added over the next couple of weeks, they will be kept up to date on our Upcoming Actions page. 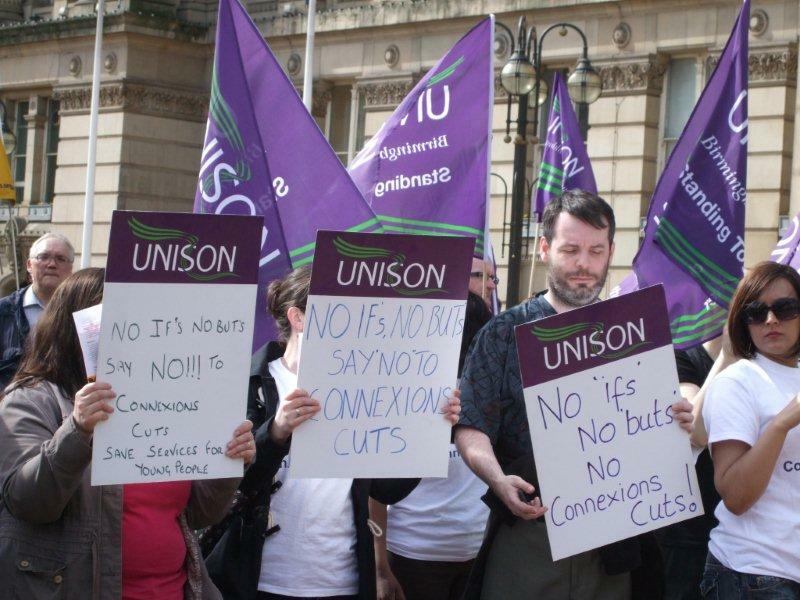 This week, on Wednesday 6th, Connexions UNISON have a strike, pickets from 1pm outside of Connexions offices on Broad Street, in Northfield and Kings Heath, followed by a rally in Victoria Square from 2:30pm-3:30pm. They are striking over job losses. Connexions provides career and other advice to 13-19 year olds. foster care into independent accomodation with reduced support. Then next week, Francis Maude visits Birmingham on Friday 15th April, PCS have called a demonstration from 9am at the ICC. There will be local meetings and hustings around Birmingham in the run up to the local elections in May and we will do our best to keep you informed of those. Hope you can join us for some of these events. March 23rd is Budget Day, when the ConDem coalition will set out their destructive austerity policies for the following financial year. The imminent onset of austerity measures has had the effect of causing GDP to contract by 0.5% in the last quarter of 2010. The ConDems blamed snow, but Germany (which does not have severe austerity measures in place), grew by 0.6% GDP. Nobel prize winning economists like Joseph Stiglitz and Paul Krugmann have argued against austerity measures, and even the IMF has warned that if too many countries introduce austerity measures this could cause the global recession to return. We argue that cutting government spending at a time of weak, jobless growth, is not the best method for reducing the deficit, and that there are alternatives. See False Economy for more information. Come and join us on the 23rd March to demonstrate against austerity measures, and meet other people who are going to London the following Saturday for the TUC National Demonstration for the Alternative. Birmingham City Council’s deputy leader has spoken of his frustration and exasperation at the “draconian” budget cuts forced on the city by the Government. Coun Paul Tilsley is among 91 Liberal Democrat councillors to sign a letter accusing Tory Local Government Secretary Eric Pickles of gunboat diplomacy and “shaking a stick” at councillors. Birmingham City Council is facing amongst the largest budget cuts in the UK, far more than wealthy, tory strongholds, despite the fact that Birmingham has the highest unemployment rate of any city in the UK. We have seen that the prospect of national cuts, and the ending of the effects of the stimulus provided by quantitative easing led to a reduction in GPD of 0.5% in the 4th Quarter of 2010, and believe that the implication of cuts for this city (and indeed the UK as a whole) is a continued reduction of GDP, and the job losses that accompany that. Birmingham Against the Cuts is calling for councillors to vote against cuts in the budget for 2011/12. We hope that Coun Tilsley follows through on his criticisms of the council budget settlements by voting against the cuts. On the 17th of February, there is a public meeting, 7:30pm at the Council House. Plus speakers from Local campaigns, and contributions from the floor. On Saturday 26th Feb there will be a rally and march, assembling at Birmingham Cathedral at noon. March route is to be agreed with police/council. Speakers to be confirmed. This is the time to come out and show your opposition to the local cuts. On Tuesday 1st March, there will be a demonstration outside the council house from 2pm (it’ll be going into the evening so join us after work ). This is the meeting at which the council budget will be set, and we need to have vocal and visual reminders to councillors that they should be voting against any cuts to local services. Student protestors were today joined by workers and parents to protest against the scrapping of EMA, which pays up to £30 to students from families with low incomes who continue into Further Education. A report from the IFS found that EMA pays for itself and increases education participation and improves outcomes. The protestors began at Waterstones, and decided to occupy RBS which announced £7Bn of bonuses earlier this week, to highlight the inequities of the cuts – which are hitting working class families hardest, whilst leaving the wealthiest untouched (remember that the Times rich list 2010 showed that the richest 1000 individuals in the UK increased their wealth by 30% between 2009 and 2010 – some £80Bn). It has been reported that Parliament will vote on EMA on the 19th January now. We hope that they will vote to keep EMA, and would encourage everyone to write to their MP, using http://www.writetothem.com, to express your support for a benefit that directly allows working class people to continue in education, and improve their skills and qualifications. We will let you know of anything further protests or actions that are planned in Birmingham, so you can join the students on the streets to fight this cut. 26th Feb: Planned for a march/rally in Birmingham City Centre against the council cuts – Birmingham city council have their budget setting meeting on the 1st March, and this demonstration directly beforehand will be to let them know that the cuts that they are implementing for the ConDem government are not acceptable. Route, times and speakers are currently being arranged, but please put this date in your diary, and let people know about it.